What follows is the 2nd of eight disaster lessons from site. We ask what went wrong and review what we’ve changed in our practices to prevent it from happening again. An archive of the series can be accessed here. Staged payments are larger but less regular than monthly payments. We recognised that this request likely related to the builder’s aversion to paperwork, but were unable to see any problem with it, so accepted his request. After the first few months of construction had passed, it became clear that the staged payments were a problem for the builder. They were simply spread too far apart. He might not have liked the paperwork involved with monthly payments, but the stop-start cashflow really hurt him. First, he began to disappear from site for weeks at a time. Though the builder refused to provide explanations for his absences, we suspected he was taking on smaller commissions with fast turnarounds to keep the money flowing. These periods of non-activity on site stacked alarmingly, stretching what was supposed to be a nine month construction period out to 18 months. Second, in order to reduce the money he would owe subcontractors, he began to take on specialist trades like concreting, plastering, plumbing and hydronic heating himself. He had to redo many of these, as his workmanship was not up to an acceptable standard. He also made errors that were impossible to rectify, things like bootprints in finished concrete surfaces and hydronic heating lines emerging crookedly from concrete slabs. Though the builder never came clean with us or our client, we had no doubt that he was struggling financially. If the project had proceeded according to schedule, he would have received his staged payments once every two months or so. As the schedule stretched further and further, there were times when four or five months passed without payment. The poor cashflow created a vicious cycle that stretched the project timeline and impeded cashflow further. The builder was not capable of extricating himself from this cycle. He had dug his own hole and everything he did, in terms of both his poor scheduling and inattention to quality, only served to make the hole deeper. This experience was powerful proof of the importance of cashflow on site. Consider: on a $500,000 project, the builder’s profit margin is around 15%. In other words, he pays and receives $425,000 in order to earn just $75,000. He also has to pay suppliers and subcontractors before our client pays him, the gap between which might be as much as two months. He must therefore keep the money coming in or the cycle will disintegrate. The lesson we learnt was simple: we no longer accept project payments by stage. Even if the builder is paperwork-shy, and we must produce additional paperwork to compensate, we insist on monthly payments. 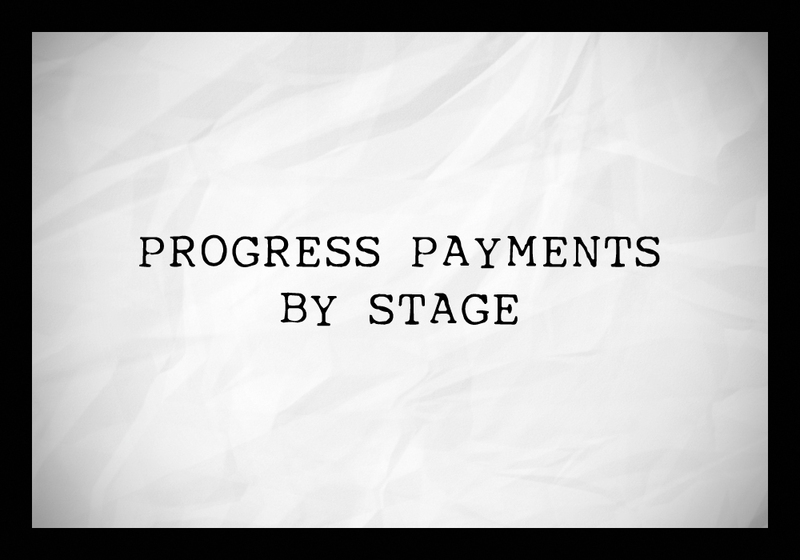 Progress payments by stage, author’s own image. Thanks for the post. This sound like a error of inexperience from the builder. For most smaller residential project here in NSW are run as staged payments. My hunch is that this builder may have more experience with smaller quicker projects where this staged progress payments actually plays into the hands of the builder where they can at times make 2 claims within the month thus getting a better cashflow situation. I have seen this happen to builders using staged progress payments on a larger $900k project. I also suspect in his case he also under priced the project. You mention 15% margin, I would have thought that this is also a little thin on a 500k project. I have usually seen 18-20% at this price level. Of cause this may only end up as about 15% or less if not managed well. I wonder if the builder also ran into issues of under pricing the project, again indicating lack of experience. Thanks for your comment, David. I think in this scenario that you’re right. He never said so, but I’m certain he underpriced. The issues were all wrapped up together.